Jordan Courtney (#20) shoots a jumper with four Eastfield Harvesters caught flat-foot during the MAC quarter finals. 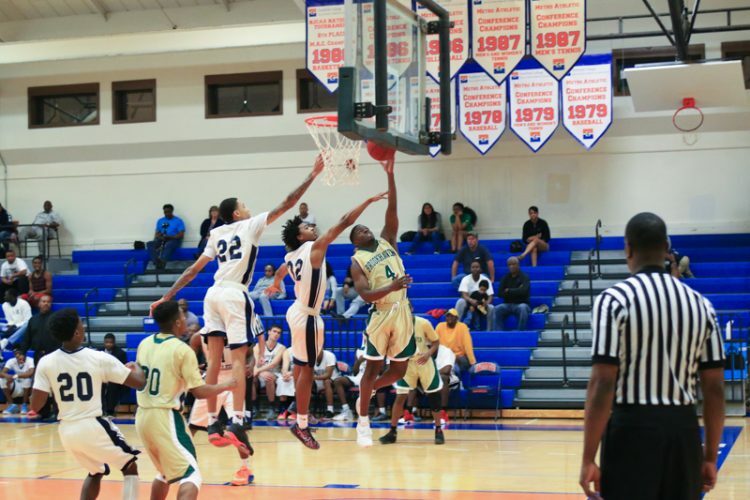 The Brookhaven College mens basketball team broke its 11-game losing streak, beating the Eastfield Harvesters, 102-98, in their first game of the Metro Athletic Conference quarter finals Feb. 21. The Bears defeated the Harvesters for the first time in the past two years. Brookhaven took command of the game from tipoff. The Bears took rebounds and prevented shots from the Harvesters which led to an impressive show of force that put the Harvesters back on their heels. Within the first four minutes, Eastfield showed signs of struggle. The Bears’ three-two and zone defenses gave the Harvesters more than they could handle just short of a defensive clinic. With 12 minutes left in the first half, the Bears led 25-17, which set the tone for the game. 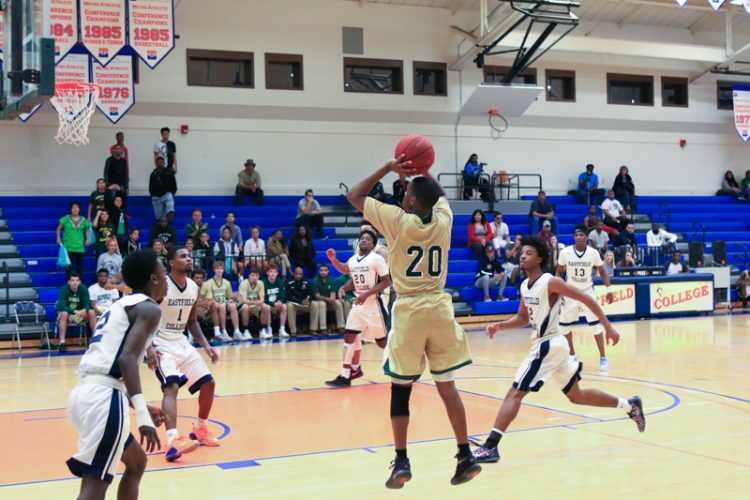 On their home turf, the Harvesters were unable to handle the Bears’ defense jump shots or layups. At the half, the Bears led 55-46. Jeremy Ford (#4) attempts a layup against two Eastfield defenders. In the second half, the Bears threw their paws down fast, taking the lead to 10 points. Rotating players from each bench, Eastfield tried putting a full-court press, switching its defense from zone to three-two and back to zone. None of Eastfield’s efforts seemed to work. The Bears pushed their lead to 72-57 with 13 minutes left in the second half. The clock was not in the Harvesters’ favor and timeouts would not help as the second half became a 3-point storm. Foul trouble late in the half set the tone for the latter part of the game. As the clock counted down, the momentum changed and the Harvesters pulled within 4 points, 96-92. With less than two minutes left on the clock, the Harvesters took a timeout. The Bears held on, with 58 seconds left in the game Eastfield called time out. The Bears ended the game with the score at 102-98, obtaining their first victory since Dec. 17. They moved onto the MAC semifinals where they 75-67 to Richland College Feb. 23 ending their season with an overall standing of 14-17. This entry was posted in Sports by The Courier. Bookmark the permalink.